Here are some recipes to make your Chag La’Illanot a festive one. Winter is almost here and nothing says comfort like a rustic Italian dinner. Rosh Hashanah and the ensuing Sukkos holiday season are nearly upon us, and if you are a busy person but still like to serve nice meals, then you are surely thinking about how and what to cook. Below, you will find some great recipes that can be prepared in advance and then frozen. This way you can concentrate on yom tov itself and enjoy time with your family. “I work around the Jewish calendar, always trying to think of creative spins,” noted Chani. 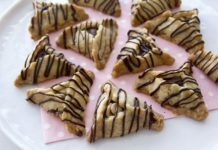 “Outside the box” Hamantaschen recipes that will transform your Purim treat from ho-hum to yum, Tnuva’s culinary experts and renowned culinary artist Jamie Geller have come up with some lip-smacking dairy offerings that will elicit a “wow” from both friends and family. Now that my son has graduated from mashed entrées of sweet potatoes and carrots to grown-up grub, it's back in the kitch for me! The combination creates a synergistic deliciousness that will bring your meal to another level. In honor of Purim, Outré EATS presents a new take on traditional Persian fare. I sometimes -- ok, often -- envy my friends who cook daring, exotic dishes and throw crazy things like fruit into veggie salads. Innovative stuff like that doesn't go over so well in my house. I can prepare it, but Hubby will stare down at the unfamiliar thing on his plate with suspicious distaste. He's a creature of habit, even more so a creature of tradition. Not only does he want to eat the same things, he wants it prepared in the most traditional way. To him, it's not really Shabbos without classic gefilte fish and chicken soup. And even when its 99 degrees outside, steaming hot cholent and potato kugel better be on the menu. I am obsessed with Trader Joe’s chili lime seasoning. Most, if not all, of the Trader Joe’s spices are under the OU, and are just amazing. Yeast dough is considered one of the most basic but complicated of the dough family. Just think of the first cakes you made – I'm almost sure they weren't yeast cakes. But mine were! Chanukah is such an exciting chag to look forward to. Not just because of the presents and the menorah, the lights and the chocolates - and the fact that I feel like it's a really fun kids' holiday - but it's so exciting to actually be able to serve freshly baked food. The children miraculously and unanimously agreed to wear pajamas as their costumes this Purim! As we mentioned last time, chicken or meat leftovers can be used in a variety of ways. First, you have to evaluate how much food is available and then with easy planning you can calculate how many family meals can be prepared from it. The following are some wonderful suggestions for meals. It is that time of year again when you can find in your supermarkets a large selection of fresh and frozen turkeys. These popular little puff pastry parcels are usually filled with potatoes, mushrooms or spinach and cheese. They can be served as snack, as finger foods at a Shabbos kiddush, or as part of a summer picnic. They are a genuine Sephardic-Jewish creation, copied by others throughout the Eastern Mediterranean. They can be served hot or cold; you can prepare them in advance, and then freeze, unbaked. Just pop them into the oven when needed. Come Rosh Hashanah and Sukkot, there are extra guests for dinner; I am always looking for a tasty family meal that everyone will enjoy.